Scalextric 'Legends' Limited Edition 2500. 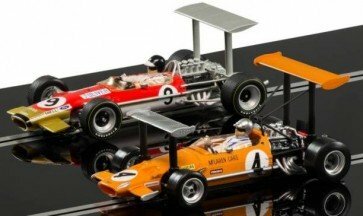 Team Lotus Type 49 Vs McLaren M7c. Race and Driver - 1968 British Grand Prix, Jackie Oliver The 1968 British Grand Prix was held at the Brands Hatch Circuit on 20th July. Both Hill’s and Oliver’s Lotus cars claimed the front row of the grid in qualifying along with Siffert, 4th on the grid, and much was expected. Graham Hill, in his Lotus 49 retired with a broken half-shaft on lap 26. Later, on lap 46, Jackie Oliver also retired the other Lotus 49 with transmission problems. The race was won by Jo Siffert in a Lotus 49. Team and Car - McLaren M7 Race and Driver - 1969 Monaco Grand Prix, Bruce McLaren The 1969 Monaco Grand Prix held at the Circuit de Monaco on 18th May, was the third round of the 1969 Formula One season and saw the surprise arrival of the double high-wing McLaren M7C. Bruce McLaren qualified 11th and finished the race in 5th. In this race the wings survived, unlike the previous race in Spain. Due to their dangerous potential, aerodynamic wings were banned after the Monaco race but would return, albeit under stricter regulations, at the next race.